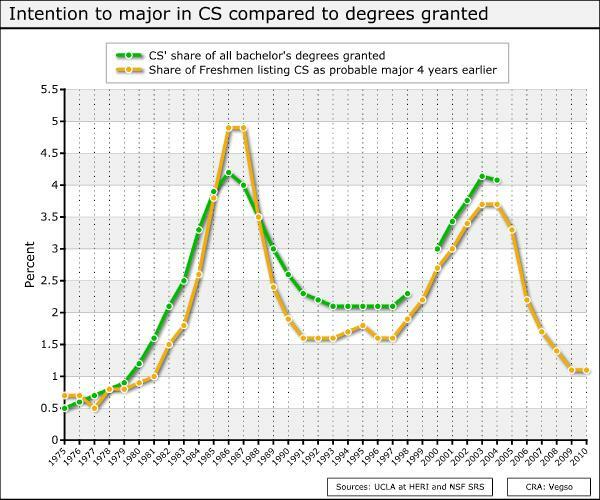 As shown by the following graph, the percentage of U.S. college students earning bachelor's degrees in CS peaked in 1986, with the percent of freshmen planning to major in CS peaking for the classes of 1986 and 1987. Why was there a precipitous fall after these years? As always, claims should be backed by data. This question is relevant to CS departments planning to understand and plan for changes in enrollment. This question is related to, but different from, this question about gender distribution of CS majors. tl;dr- That peak around 1986 looks pretty difficult to explain in terms of interest. After searching a bit, I found a paper that attempts to explain it in terms of teaching capacity. This paper argues that the rapid rise in student interest in the early 1980's flooded Computer Science departments, forcing them to raise entrance standards to avoid being overwhelmed. I'm not 100% sure if this line of reasoning is entirely solid, but presenting it here as a partial answer. If nothing else, the idea that departments had logistical troubles accommodating a rapid rise in CS students seems to make sense as a contributing factor. This answer's based on "A History of Capacity Challenges in Computer Science" (2016). As we can see in the plot, there's a rapid rise in Computer Science majors until the mid 1980's. It seems generally agreeable that this followed from computers being an interesting field of study. The rapid increase in student demand at the beginning of the cycle is easy to explain. The late 1970s and early 1980s saw the introduction of the personal computer, which brought many more people into contact with computing. I believe that what happened in the 1980s is best described as a capacity collapse in which universities and colleges were simply unable to satisfy the growing level of student demand. Departments tried a number of strategies to increase their teaching capacity, including retraining faculty from other disciplines and hiring adjunct faculty from industry. In the end, however, demand overwhelmed capacity, and colleges and universities were forced to restrict admission to the computer science major, which gave rise to the subsequent downturn. Even though institutions tried many strategies to expand their teaching capacity, they were eventually overrun by the relentless increase in student demand. Although the report from Snowbird 1980 had warned that “limiting or cutting back enrollments would be counterproductive given the societal need manifested in the rising enrollments,” universities and colleges were forced to do just that. Most of those limitations were based on academic performance and were extremely restrictive. At Berkeley in the mid 1980s, for example, only students with a 4.0 GPA were admitted to the major in Electrical Engineering and Computer Science. From a systems approach, capacity issues do make some sense for explaining a peak like the one here. The rapid inflow of students could be allowed since they were filling available capacity; then, once that capacity was taxed and admissions was allowing too many students into the classroom, they'd have had to cut back on allowing new students in. The mid-1980's peak is the basically one place where Freshman interest is higher than degree completion. This can make sense in the capacity explanation, because interested students would've been less able to achieve a CS degree due to rising entrance requirements. However, it's still strange that student interest drops back below obtainment after that. If it really was a capacity issue, then maybe students reasoned "CS is too hard" or "I don't have the grades/background to get into the CS department"? The Atari VCS game E.T. came out in December 1982, which led to the start of North American video game crash of 1983, the end of a video game software industry boom. That market fell from 3.2B to perhaps 100M (in U.S. dollars) in just a couple years. Programmers were being laid off in droves. Boxed software was being sent to landfill. Software and computer startups were starved for capital, or went under. Game software developers lost much of their temporary "rock star" status. That business event may have discouraged lots of kids from picking or sticking with a major where employment would have to come from a visibly crashed job market. The dot-com stock market crash of 2000 (which also led to a vast number of computer industry related job lay-offs) probably had a similar effect on CS graduations after 2003. Just after the '83 video game crash, easier-to-use personal computers (Mac, Amiga, Wintel, et.al.) were being introduced, which may have allowed end-user (business, science, etc.) productivity to increase faster than the number of software jobs previously required to support that productivity, thus making alternate (non CS) careers possibly more valuable, or more interesting to students, than CS related ones. Added: The steep rise starting near 1980 is coincident with the PR leading into and through the IPO of Apple Computer (et.al.). Computer magazines were becoming thick with ads. Lots of kids wanted to either become a personal computer start-up company stock option millionaire, or at least work for one. Added: The Netscape IPO (and PR about the millionaire programmers it created) in late '95 looks like it was a just a few years before a similar steep rise in CS graduation rates. I see two reasons - unnecessary math classes and poor advertising. As background, I am about to become a Computer Science High School teacher after a 27 year career at IBM where I was a programmer and project manager. I was shocked to see the interest in computer science in high schools to be same as I saw in the late 70's when all we had was FORTRAN and Radio Shack TRS80's with floppy disks. I was a computer science major at University of North Texas (UNT) from 1982 to 1987. When I started at UNT an "average" college student that worked hard could get a Computer Science degree. At that time UNT was said to be one of the top 20 computer science schools in the country. Then, if memory serves, around 1985/1986 the Association of Computing Machinery (ACM) got involved by setting a "national standard". As part of that standard the requirement for Math courses went up. From what I have seen, more computer science programs are now in the colleges of engineering which also require more math. If a student has to take that much math, they go ahead and become engineers. The math requirements are completely unnecessary. Calc 1 and 2? Linear Algebra? Physics? Why? How many are going to program the space shuttle? They need communications skills and experience in programming. They need configuration management. No customer ever told me that my consultant needed more math. The requirement for math drives the "average student" to business or the social sciences. The other thing I see is the advertising for computer science classes is geared for the "genius" type of student who could build a robot with a can opener and a old flashlight. Students see the computer field as if is filled with geek geniuses doing impossible things. Don't get me wrong, we need those students. But not every project is a IBM Watson Research project (I worked on a project with those guys and they are geniuses). Most computer science work is (wait for it) for a business where there is a business need and business solution. I didn't need geniuses to solve those problems. The geniuses hated those projects. I needed folks that could communicate, code, and work in teams. Silicon Valley needs the geniuses but how many of our graduates end up in Silicon Valley? In net, the math requirement is driving students away (even in high school, let alone college). Even Business Computer Information Systems degrees out of the College of Business are requiring Calculus 1. I am not saying lower the standard. I am saying raise the standard in areas that matter to the student and their employer. Let students choose between additional math or communications or additional programming classes or whatever they feel would suit their future the best. A one size fits all degree standard from the ACM does not work. Not the answer you're looking for? Browse other questions tagged student-motivation social-context or ask your own question. Why did the percentage of CS bachelor's degrees going to women peak in 1984?